Service Untitled» Blog Archive » Be creative with error pages. Be creative with error pages. Have you looked at your error pages recently? Your 404’s, 500’s, and so on and so forth? Probably not. After reading this blog post, I just updated the 404 error page on my own blog. The idea is that a helpful error page will be more friendly and help prevent customers from getting frustrated. A page that just says “this page can’t be found” or states that there has been a “server error” doesn’t help anyone. Including a form (like the company I linked to chose to do) or some alternatives and information for the customer (like I did) provide customers with a more productive alternative. Designing a good error page is not complicated. Just keep the customer in mind. If you were a customer viewing that error page, what would you find to useful? If you were the developer, what would you want the customer to know and what would you want the customer to tell you? Simple questions with answers that could help you as you develop your product or your web site. Take a few minutes and update your error pages. Add some links and useful text. Mine used to say “The page you are trying to access cannot be found.” I updated the page to include more information, look better, and be friendlier. It took 15 minutes and I’m sure it will prove to be worth it. For more examples of interesting 404 error pages, check out this post at Smashing Magazine. 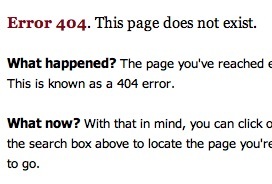 Not all of the examples are “good” 404 pages, but a lot of them are creative and interesting. At VoiceSage, in the development stages, we found that changing the error messages so that they were as specific as possible was a huge help to users. Where you might be tempted to say “failed message delivery” we now have messages that are specific to the reason for failure (incorrect number, number no longer in service, tried three times and no reply etc. etc.). Result? The service just looks smarter, and overall, easier to use. The unexpected learning? once users had visibility on the reasons for failure they were able to schedule activities to fix the route cause of the problem (i.e. number list management, asking the customers for alternative contact numbers, etc. ). Win Win. « Give customers your own email address.